Lost in Lace explored and developed the relationship between the magical, symbolic spaces associated with darkness, and the abstract, multidimensional spaces affiliated to emptiness. The work was large scale and created by an international grouping of artists, designers, and architects, referencing the 'projection of lace on space' (Araujo 2005). Lost in Lace was the outcome of a three year research project which was concerned with how we move through the built environment. The project took the construction and cultural understanding of lace as the context within which the research and final exhibition outcome would be placed. The project also explored the Japanese notions of Ma (transitionary space)and Hashi (the edge). The bringing together of lace and these two Japanese undertandings of space proved a particularly rich conjunction with which to explore ideas about walls, boundaries, borderlines and margins, shadow and light, transparency and opacity. An international group of practitioners from different fields: art, video, design, architecture, photography were asked to move beyond their usual margins of practice in response to the challenge: how to revolutionise the configuration of the space through the use of the structural and cultural implications of lace net-works? The exhibition funding reflected the range of practice in the exhibition with support from both the Arts Council England and the Crafts Council, being the first 50:50 partnership between the organisers and the Crafts Council. 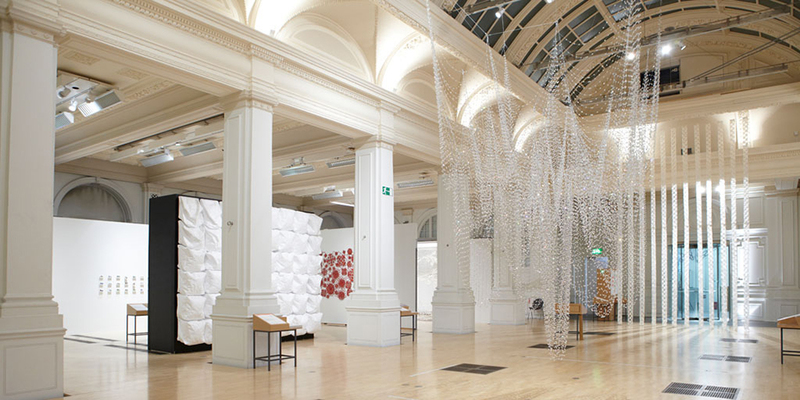 The outcomes were shown as an exhibition in the Gas Hall, Birmingham Museum and Art Gallery, the first time this space had been used for a contemporary site-sensitive exhibition. 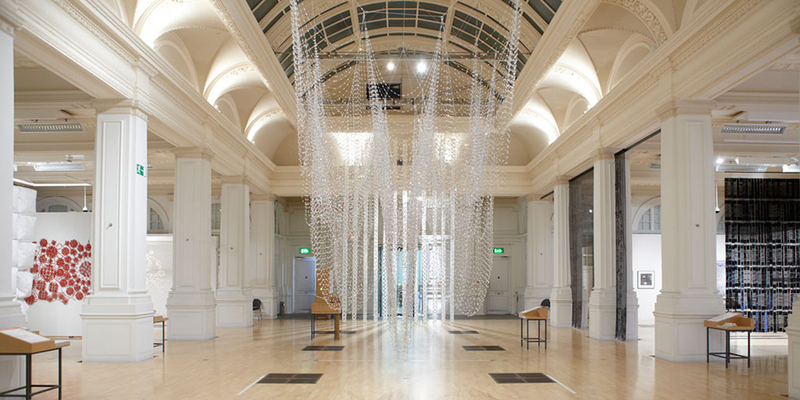 A 3.6 x 3.5 x 6.5m inverted crystal cathedral inhabited the centre of the space, made from 1,000 strands of Swarovski crystals, generously donated by them to the architect Elena Manferdini for the project. The exhibition received over 40,000 visitors, the most successful exhibition to that date in the Gas Hall, with organised visits from 19 schools, universities and professional bodies, 3 curator's tours and a special evening organised by the Times newspaper and plus an international conference. The curator gave interviews on Woman's Hour and the Radio 2 Arts Programme. It was covered in the national and international press and specialist magazines and on the BBC World Service. 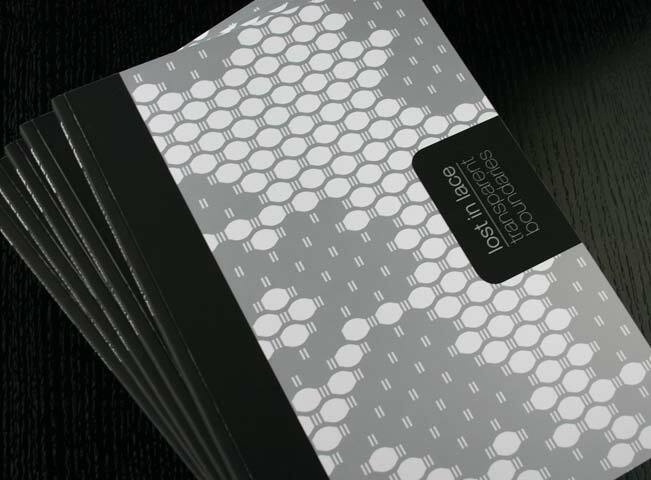 The Lost in Lace catalogue is a high quality, fully illustrated book designed to reflect the concepts underlying the exhibition. The curator, Lesley Millar, contributes an essay in which she discusses ideas concerning boundaries, borderlines and space. 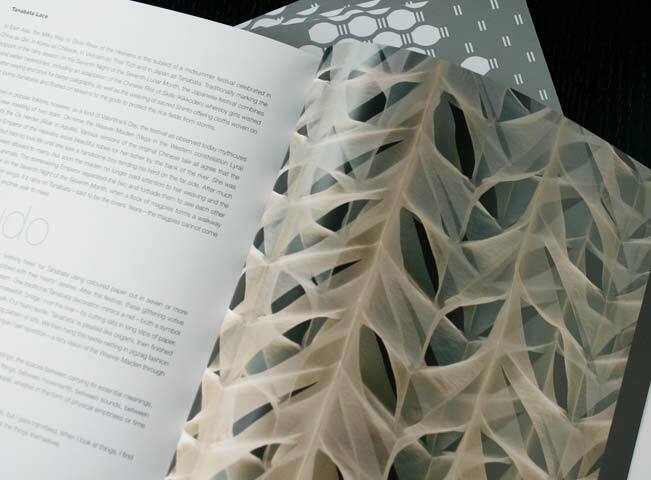 Other essay contributions from writer on architecture Oliver Lowenstein and lace experts Gail Baxter and Carol Quarini. There is a special 'behind the scenes' section revealing the email discussions and decisions involved in the installation of a particular work. This is followed up with email conversations between the curator, architect Richard Reid, composer Jeremy Dales Roberts, film maker Lutz Becker, Birmingham Museum and the artists, which run as a thread through the book forming a lace network of connections.